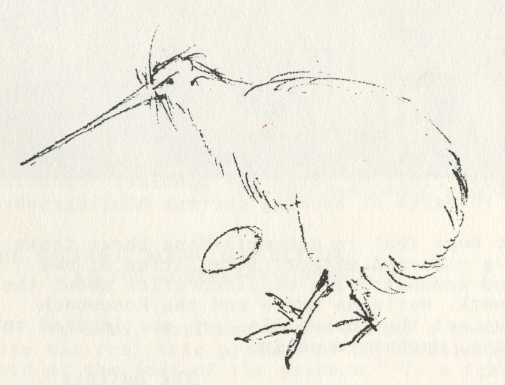 A drawing by Marianne Moore of a "Kiwi and Egg" made at the Museum of Natural History, New York. Subscription: Two issues a year, Spring and Fall. U.S.A. $4.00 a year; Foreign $4.50 a year. Please make cheques payable to MMN, The Rosenbach Foundation. Address correspondence to Patricia C. Willis, Editor, MMN, The Philip H. and A.S.W. Rosenbach Foundation, 2010 DeLancey Place, Philadelphia, Pennsylvania, 19103. With the first issue of MMN, the study of Marianne Moore and her writings takes a new turn. In the years since 1969 when the poet chose the Rosenbach Foundation in Philadelphia as the home for her archives, word about the collection and its potential for research has spread among scholars fortunate enough to be referred to it. But the time has come to share this bounty more widely among students of twentieth century literature and admirers of Marianne Moore. Toward this end, then, MMN sets itself three tasks. Of primary importance is the presentation in facsimile of materials from the collection. Included will be manuscripts of work published here for the first time as well as drafts and revisions of work already in print. Explanatory material, such as source items for poems and prose, will appear in photographs from time to time and will provide readers with the opportunity to examine relationships between inspiration and finished product. MMN also offers a forum for exchange of ideas about MM's work. Documentation, brief notes, and queries will put scholars in touch with one another's finds and interests. Further, announcements of projects planned and descriptions of those completed will make MMN a much needed clearing house for scholars choosing new topics to research or seeking current bibliography. It is our hope that in accomplishing these tasks MMN will have a combined effect: Stimulation of new scholarship and demonstration of discoveries about the poet and her work. Marianne Moore and the Rosenbach Foundation have set the course. Readers are invited to follow it to new, uncharted goals. In 1915, Marianne Moore titled a poem "You are like the realistic product of an idealistic search for gold at the foot of the rainbow." To a scholar in the field of twentieth century verse, that title applies as well to the Marianne Moore Collection at the Rosenbach Foundation in Philadelphia. As the realistic product of her life as a poet, the collection contains all the literary and personal effects MM herself retained and was willing to have preserved. To the idealistic researcher, it is an archive so complete as to provide, or at least suggest, answers to countless questions about the poet, her work, her contemporaries, and the literary history that surrounds them all. 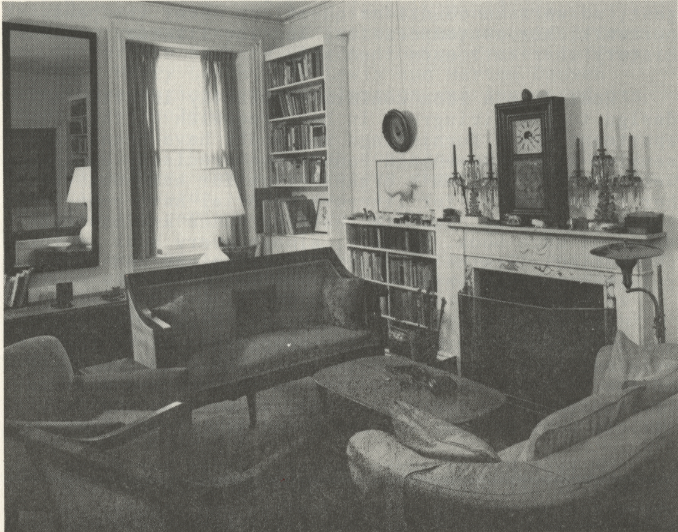 Housed in a room conforming exactly in size and design to the living room in her Greenwich Village apartment, MM's furnishings and books have been reassembled at the Rosenbach Foundation precisely as they were in New York. MM's organization for her books and her filing system for literary material have been retained, offering clues to the importance and associations of each book. In fact, almost every book in the collection contains annotations, clippings and letters relating to that work. The other books and periodicals from MM's library are arranged by author, with indications as to their original locations on her shelves. These include many of the books MM reviewed, drew on for her own writing, or received from contemporaries, as well as copies of her own publications and her bound set of The Dial. MM kept MSS of approximately 150 of her poems and of most of her prose pieces. Many of these MSS are supported by working notes, drafts, and proofs. She kept copies of nearly all her publications and her revisions can be seen in many of them. Her notebooks, containing reading notes, notes from conversations and lectures, and drawings, hold items later used in poems and prose, as well as early drafts of poems. Daily diaries from 1919 to 1969 document the dates on which MM wrote, revised, and submitted work. Stevens, Glenway Wescott, Monroe Wheeler and William Carlos Williams. From the beginning of her correspondence with literary figures, MM kept carbon copies of her letters, so in many instances the exchanges are complete. In addition, since 1972, several of MM's friends have given to the Rosenbach Foundation originals or photocopies of letters they received from MM. Letters to Barbara Church, Louise Crane, Jeffrey Kindley, Harry Levin, May Lewis and Morton Dauwen Zabel have enriched the collection and increased its value for scholars. Finally, the collection contains several thousand clippings, small decorative objects, photographs, financial records, china and silver, clothes, and articles and reviews concerning MM. Subsequent issues of MMN will focus on particular aspects of the collection as the material is sorted and catalogued. An example of the discoveries to be made in the collection, which will be reported regularly in these pages, follows in the "Observations" section. 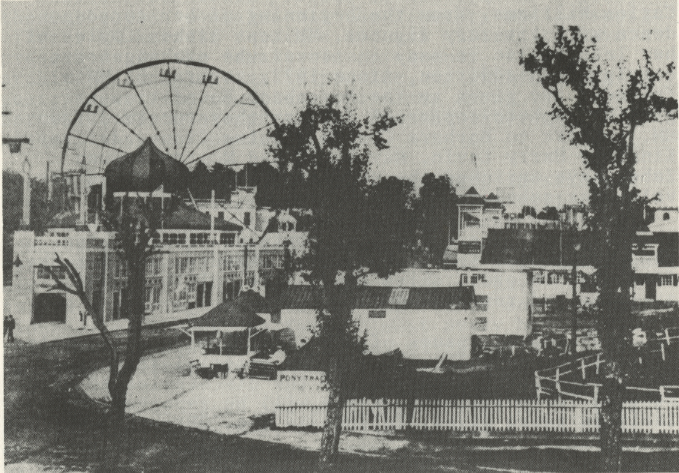 A photograph found among MM's materials at the Rosenbach Foundation supplies a visual source for "Old Amusement Park." Matched with correspondence between MM and Brendan Gill of The New Yorker, it documents the poem's composition. print of the old amusement park that used to stand on the site of LaGuardia. Isn't it charming? 1 The quotations from Brendan Gill are published here with Mr. Gill's permission. 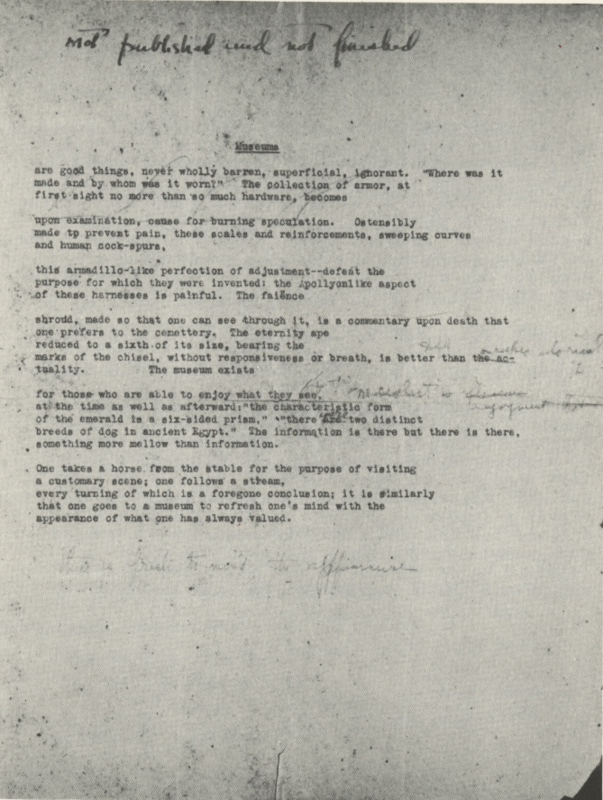 Written between 1918 and 1925, "Museums" is a poem MM did not publish or complete but nonetheless conserved. It appears here for the first time, in its two extant versions, from the collection at the Rosenbach Foundation. In response to a request, MM wrote to Ezra Pound about literary matters in America which she thought would interest him. Included in her list of her current reading were "technical- books such as Gilman's Museum Ideals of Purpose and Method" (T.L.carbon, 10 May 1921). In a notebook (Rosenbach 1250/2) MM made ten pages of notes excerpted from that book. The poem appears to be influenced by the ideals set forth by Benjamin I. Gilman, particularly the statements in the first and last stanzas of the earlier version. The examples of artifacts, however, are taken from observations MM made elsewhere. 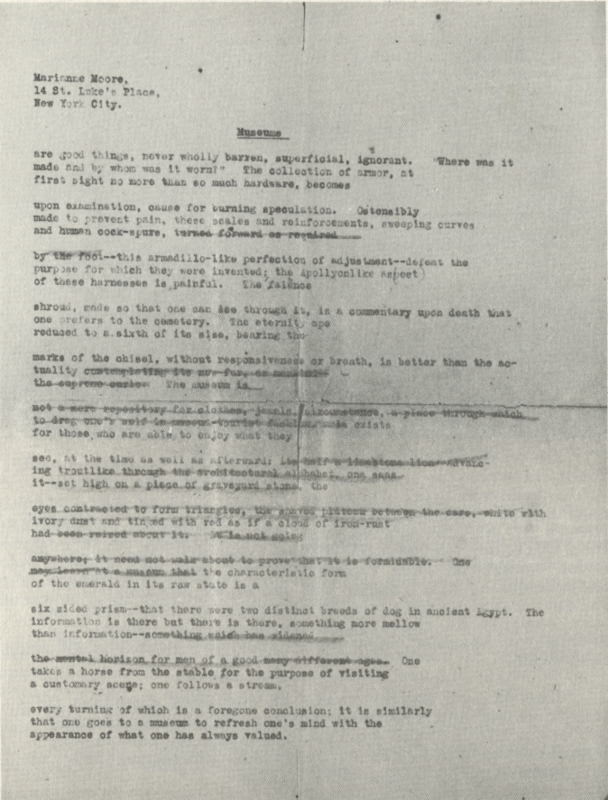 The first, longer state of the poem displays MM's strict rhyme and syllabic metric, while the second, cut according to the excisions marked on the first, demonstrates the style of revisions characteristic of her poems in The Dial, 1921 - 1925. 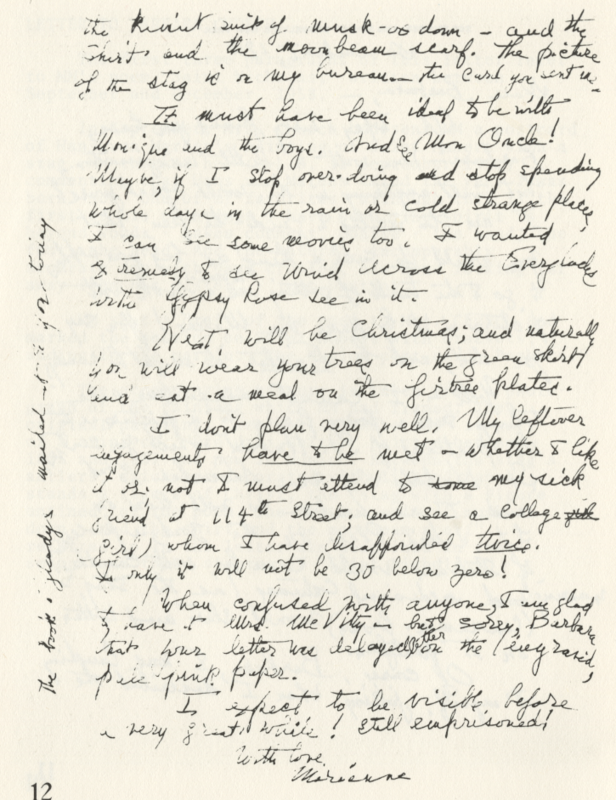 The first three paragraphs of this letter refer to MM's poem "Saint Nicholas," written between September and December, 1958. 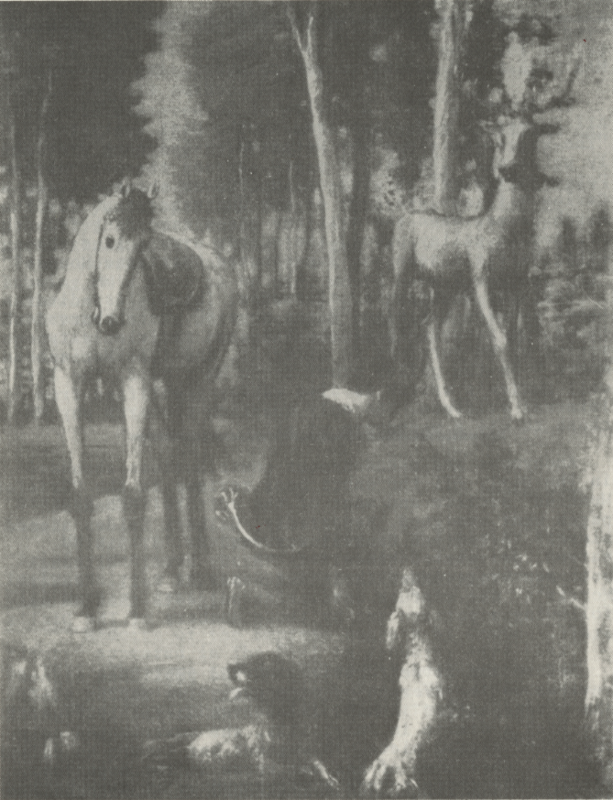 In September, Mrs. Church had sent MM a postcard of Hans von Marées's painting of Saint Hubert with a stag. MM thanked her (A.L.S. 12 September 1958) commenting that Hans von Marées "died the year I was born. Now 'one of my favorites' although this is the first of his paintings I have seen. The spirit is beyond words - makes comment, coarse - the hand, the foot, the head. And the natural, incomparably accurate dog with paws crossed, his head looking far away from his master, - just panting." MM sent a draft of the poem to Mrs. Church and marked the section on Saint Hubert with brackets, adding in the margin: "The Munich post-card, Barbara." The accompanying picture is taken from a photograph of the painting which MM had framed. The original painting, "Der heilige Hubertus" is part of a triptych, "Die drei Reiter" painted between 1885 and 1887 and now in Munich. Between the stag's antlers, which are decorated with lighted tapers, stands a figure of Christ, the "stag with a Figure entined" of the poem. The "kiviut suit of musk-ox down - and the shirt and the moonbeam scarf" referred to in the letter are described in the second and third stanzas of "Saint Nicholas." In January, 1927, a review of Sacheverall Sitwell's All Summer in a Day appeared in The Dial, entitled: "The Way We Live Now" by Peter Morris, a name previously unknown in The Dial's pages. During the next month, Peter Morris was at work on an article about William Carlos Williams, "A Poet of the Quattrocento," for the March issue. When the Williams piece came back from the printer in galley proof, the editor drew a line through Peter Morris's name and substituted "Marianne Moore." Marianne Moore, was, of course, The Dial's editor then, and she was also "Peter Morris". Were there doubt about the authorship of the Williams article, a typescript by MM survives to allay it, and the "Marianne Moore " on the galley proof is in MM's hand. The Sitwell review's writer is also easily identified from internal evidence. The only question concerns why MM chose to use a pseudonym at all. Anonymous and pseudonymous contributions abounded in The Dial. All the short book reviews in the "Briefer Mention" section and most of the editors' "Comment" pages went unsigned. Repeatedly, Gilbert Seldes signed himself "Sebastian Cauliflower" and Dr. J. Sibley Watson, Jr. masked himself as "W. C. Blum," although both men wrote under their own names as well. "Peter Morris's" one venture into print suggests that MM was following a pattern set by those members of The Dial's staff. to what she thought were too many articles bearing her name but between January and March, 1927, changed her mind. The review signed "Peter Morris" does not differ enough from other more laudatory reviews to demand a shield for its author. During the 1960's, MM helped Nicholas Joost to identify unsigned material in The Dial, but "Peter Morris" escaped his The Dial: Two Author Indexes as a pseudonym for MM or for anyone else. Perhaps after a forty year lapse, MM forgot about the pseudonym; possibly, she preferred to keep it to herself. In any case, although Mr. Sitwell might have discovered the "Peter Morris" identity from a close reading, Williams, knowing MM's work as he did, would have found out the author at a glance, rendering the pseudonym useless. But even one use of an assumed name is enough to prompt speculation about other pseudonymous work by MM yet to be discovered. MM's first anonymous review in The Dial's "Briefer Mention" section has escaped indexing. But fortunately, a typescript kept with MM's personal Dial papers identifies the piece as hers. "Memoirs of the Empress Eugenie by Comte Fleury" appeared in The Dial in January, 1921 (LXX, p. 107). The same issue carried her long review of Evelyn Underhill's Jacopone da Todi. These pieces were MM's first prose contributions to The Dial. "Wonderful how literary history is written. You may have heard of a little pre-1914 paper called the Egoist which ran Joyce's Portrait as a serial, and of which I was literary editor until I went to the wars,1 and then TSEliot got my job. Well, of course Pound and Eliot gave Patricia Hutchins the dope for her Joyce book, and I find that what I did for the paper is entirely credited to them, mainly to Pound. Now I discovered and published the first poems of Marianne Moore; André Spire was a friend of Frank Flint's2 and mine, and through the Egoist Press3 I published some of Spire's war poems at my own expense; and I found and translated some of Lautréeamont [sic]. All of this is credited to Pound! Not that it matters — who cares? But they are so anxious for their backstairs renown they grab at anything. . . . The foregoing excerpt is from a letter written 29 January 1968 by Richard Aldington (1982-1962), British poet, editor, critic, translator, novelist, and biographer — then living in the south of France near Sury en Vaux, Cher — to his long time friend, Eric Warman, with whom he had begun to correspond in 1932 when the younger man wrote the successful author of Death of a Hero and The Colonel's Daughter to compliment him on his work and seek his advice on a literary career. At this time, and in the years immediately ahead, Warman was able to repay Aldington's early friendship by helping the old writer obtain commissions from publishers with whom Warman was associated. Specifically Aldington takes issue with the sentence beginning "from abroad Pound obtained some of the work of . . ." which does seem to credit Pound with various "discoveries," including Marianne Moore's first poems, that Aldington felt were his. As Aldington undoubtedly knew, however, "literary history is written" to be rewritten, for only by constantly rearranging the details of a given period do we finally, like an aerial photographer fitting his pictures together, get a true map. Besides, to be just to the pioneers who did the early mapping, in a period dominated by figures such as Pound, Eliot, Yeats, Joyce, and Lawrence it is easy to overlook the accomplishments of writers around them. Marianne Moore's first professional publication (her first poems printed were in the Bryn Mawr literary magazine Tipyn o'Bob and in the alumnae magazine, the Lantern) was in The Egoist of April 1, 1915, where two poems, "To a Man Working His Way Through a Crowd" and "To the Soul of Progress" (later called "To Military Progress") appeared.6 Miss Moore seems to have sent these poems unsolicited in early 1915 when Aldington was assistant editor and in charge of the literary content of the magazine although Pound remained in the background as unofficial advisor. The next year H. D., who had been married to Aldington in 1913, wrote a letter to Marianne Moore, sending it to Bryn Mawr for forwarding, and asking if she were the same Marianne Moore who had been her classmate at Bryn Mawr.7 This seems to indicate, for one thing, that biographers who have suggested that Miss Moore's poems gained access to The Egoist through her friendship with her classmate H. D. were mistaken. One month later, in May of 1915, Poetry: A Magazine of Verse published five of Marianne Moore's poems.8 Pound, who was Poetry's "Foreign Correspondent," wrote Harriet Monroe on May 17, "My gawddd! This is a ROTTEN number of Poetry. Dear H.M.: It is honestly, pretty bad. [Marianne Moore's] titles are nice . . . ."9 This seems to suggest that Pound was neither responsible for "obtaining Miss Moore's work for The Egoist nor for introducing her to Poetry. Therefore, while Pound's influence on Poetry and The Egoist surely helped to provide the necessary conditions to encourage publication of new poets such as Marianne Moore, and while it is a fact that Pound later directly helped and encouraged her,10 if anyone "discovered" Marianne Moore's first poems, Richard Aldington is correct in claiming that honor. 1Aldington and Leonard A. Compton-Rickett were assistant editors from the first issue of The Egoist (1 January 1914) through the June Numbers; with the July 1 number, Aldington alone became assistant editor and remained so until 1 June 1916 when H. D.'s name joined his on the masthead as assistant editor. Aldington went into the service in this same month and was able to carry on his work at The Egoist with the help of his wife until June of 1917 when Eliot took over as assistant editor, a post he retained until the last issue in December 1919. 2Close friends, Flint and Aldington were at the center of the Imagist movement; they worked together on the first number of Harold Monro's Poetry Review; poems by both poets were published in each of the four Imagist anthologies. Cyrena N. Pondrom argues convincingly (in The Road from Paris, 1974 ) for Flint's "crucial role as transmitter of information about French poetry" to the London avant garde of 1912-1920.
was published by the Egoist Press when H. D. and Bryher sent Harriet Weaver a book of poems put together from MM's magazine publications. 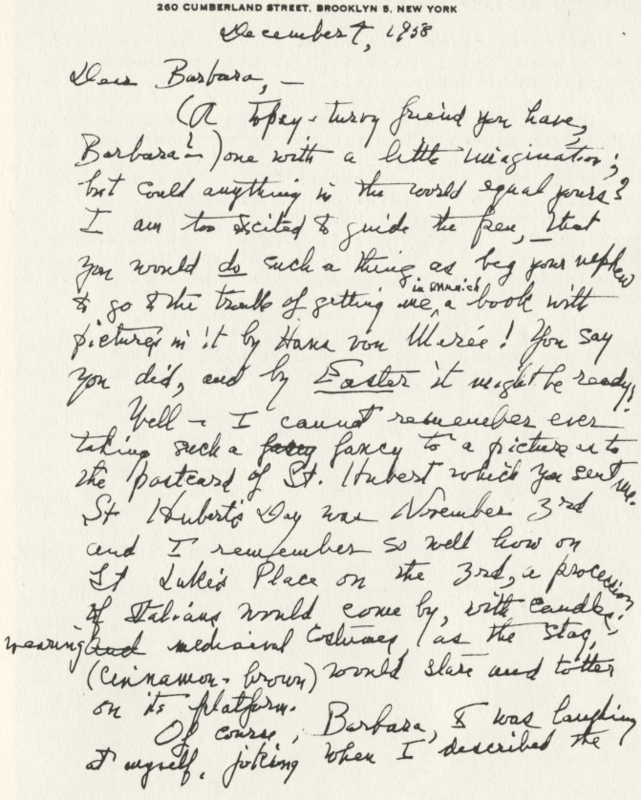 4Unpublished letter in the Aldington Collection of the Morris Library, Southern Illinois University at Carbondale. This extract is quoted with their permission and with the permission of Mr. Alister Kershaw, Aldington's literary executor, and Mme. Catherine Aldington Guillaume, holder of the copyright. 5James Joyce's World (London: Methuen and Co., Ltd.), p. 106. 6Although Aldington refers to "poems," some biographers write of "a poem." An examination of this issue of The Egoist shows these two poems over MM's name which appears in accordance with the magazine's usual format only after the second one. The first poem is also listed in The Achievement of Marianne Moore (1958) as "uncollected." 7H. D. to Marianne Moore, A.L.S, postmarked London, 21 August 1915 (Rosenbach). 8Poetry: A Magazine of Verse, IV(May 1915), 70-72. Printed under the general title of "Pouters and Fan-tails," the five poems were: "That Harp You Play So Well," "To an Inter-Mural Rat," "Counseil to a Batchelor," "Appellate Jurisdiction," and "The Wizard in Words." 9The Letters of Ezra Pound 1907-1941, ed. D.D.Paige (New York, Harcourt, Brace and World, 1950), p. 60. 10In 1918, he solicited her poetry for the Little Review and wrote, "Your stuff holds my eye." (The Letters of Ezra Pound, p. 143. A copy of Observations (1924) recently sold at auction contains an inscription by MM to Helen McGlade and Mary H. Tolman. Added in MM's hand to the notes for "Marriage," with reference to the quotation beginning "I am such a cow . . .", is the identity of the speaker, "M. Tolman," and this name is also added to the index. Both Miss McGlade and Miss Tolman were neighbors of the Moores, residents of the same building at 14 St. Luke's Place in Greenwich Village. In "To a Chameleon," MM describes "an emerald as long as the Dark King's massy one." Are there any clues to the identity of the Dark King? The "Dark King" is the only capitalized persona other than proper names in MM's poems. Some suggestions already made are Nero and Solomon who possessed large emeralds used like binoculars; Balthazar, one of the Three Magi; King Arthur; and a Pharoah to whom the Nile might have seemed a long emerald. No clear reference has yet developed from any of these suggestions. "Neatness of finish! Neatness of finish!" This line occurs in "An Octopus" following a description of Henry James's work. Is the line taken from James? "Diligence Is to Magic As Progress Is to Flight" is a strikingly personal poem directed at some member of the literary world of 1915. Can an identity be found for the "scarecrows / of aesthetic procedure" in the poem? MMN announces a prize competition for the source of the phrase "Imaginary gardens with real toads in them" which occurs in "Poetry," published for the first time in Others, 5 (1919), 5. The words appeared without quotation marks until Collected Poems (1951) , but MM added marks by hand in her copies of Poems (1921) and Selected Poems (1935). Please submit evidence in photocopied form, if possible, to the editors. In the case of more than one correct answer, the prize will be awarded for the first answer received. Beginning with the Fall, 1977 number, MMN will describe recent work on MM as well as work in progress. Scholars writing on MM are encouraged to send information to the editors on books, dissertations, and articles by 1 September 1977. Clive E. Driver has begun work on a full biography of Marianne Moore.